Motor retailer Lookers Nissan has gone back to its roots after helping to launch a newly restored Japanese Garden in Harrogate. The Japanese Ambassador, Koji Tsuruoka, opened the garden and revealed its name, Shijima no niwa, Garden of Serenity, in the presence of Harrogate Mayor Coun Bernard Bateman, High Sherrif of North Yorkshire Christopher J C Legard and Susan Mendus from Heritage Lottery, as well as over 60 invited guests. Lookers, which has a tradition of getting involved in local community projects, helped to fund the official opening of the gardens. Work on the gardens began in March 2017 after preservation group The Friends of Valley Gardens received £90,000 of Heritage Lottery Funding. The Japanese Garden was first introduced in the 1930s at a time when they were a common design feature in English estates and parks. Unfortunately, it was absorbed into the rest of the grounds over time, losing many of its period features. While finishing touches are expected to run until next year, the garden is now open to the public and includes a new entrance, bridges and signage. 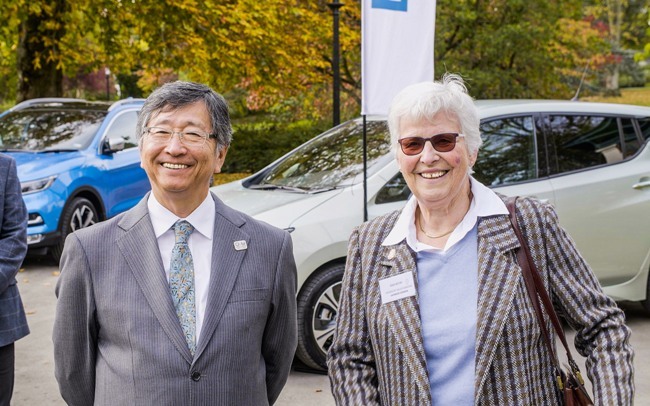 Ann Beeby, volunteer project manager for the Friends of Valley Gardens, in partnership with Harrogate Borough Council, said: “We would like to say a massive thank you to Lookers Nissan for helping us to celebrate this huge milestone in the restoration of our beautiful Japanese Gardens. It’s been a really rewarding project and one that will benefit the entire local community for many years to come. Lookers Nissan, which has dealerships on Kirkstall Road in Leeds, has a tradition of supporting community projects and recently became a Gold Sponsor of Leeds Autism Services.